Speed demons rejoice, this week’s Fortnite challenges involve speeding around the map in an ATK. 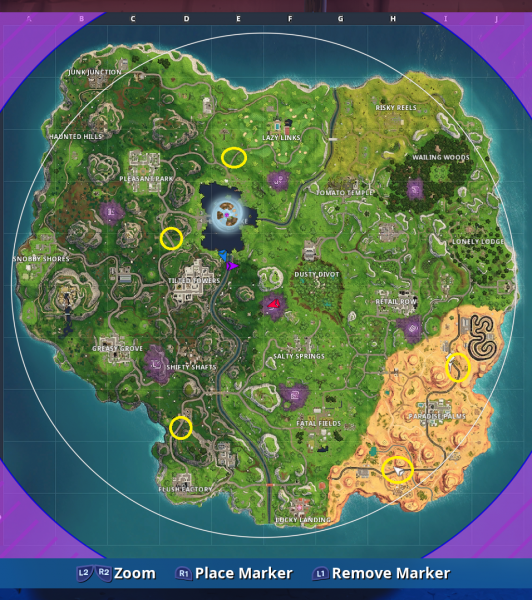 Week 5’s challenges require you to zoom past some radar signs at a whopping speed of 27 or higher. You can check out our guide on where to find shopping carts and ATK’s to complete this challenge, and here’s a map of where you can find some of the radar signs on the road. Your best bet is to stick to the main roads to find these and remember that they could be facing the other direction, so you might need to spin around and drive past them again for it to register your speed. The North road into Paradise Palms. The Southwest exit out of Paradise Palms. To the North of Flush Factory. The road to the Northeast of Tilted Towers. North of Leaky Lake on the road towards Lazy Links.